Lawns are a great addition to any property, commercial or residential. The add drama to the landscape and create a fresh and alive feel in the outdoor spaces. But turf is never a set and forget installation. Keeping it healthy, lush and green involves regular maintenance and care. For all types of lawn care services, we are the experts to call. 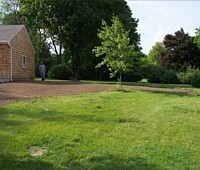 We handle ongoing lawn maintenance for many clients in Windsor Locks and Holyoke. Word of our expertise has spread to East Longmeadow, Easthampton, and the surrounding areas as well. Our company recognizes that every turf is different and it’s why we offer a gamut of custom lawn care services that help you achieve green plush lawns that are highly-resistant to insects, weeds, and disease. Lawn Fertilization Programs- These programs involve a number of steps specially designed to improve grass performance. They typically include insect and weed control and fertilization. These become the basis of beautiful and healthy lawns. Insect Control- Control of grass insects is incorporated into the lawn care program, in addition to fertilization to help prevent insect damage. Chinch bugs, grubs, and other insects can easily damage the root systems of your lawns, leaving them with bare/brown spots or other signs of damage. If left untreated, this can become very expensive to repair. The superior, timely intervention we provide is one of the best ways to keep your lawns healthy. Aeration- Aeration is a very important aspect of lawn care. The mechanical core aeration process we use, allows increased oxygen to effectively penetrate the root zones of your lawn. This helps relieve soil compaction and encourages microbial activity. Core aeration provides more space for root growth and increases drainage to help your lawns look their best. Overseed and Top Dress- Using the broadcast seeding method, we will plant new seed directly into the soil. It allows the lawns to recover from the earlier season, preparing it to endure stressful conditions in the forthcoming ones. Top quality products such as organic fertilizers, premium grass seed, and the best topsoil, and pest control products are used in the work. This helps ensure the resilience and longevity of your lawns. When you want reliable, professional services at very competitive lawn care cost, you need look no further than Keenkut Landscaping. You can speak with our experts at 413-896-9240 to discuss your project details or send us queries and quote requests through this Contact Us form and we will respond shortly.